The first important date of the Easter week, Semana Santa, (Good Friday: 30 March 2018, Easter: 31 March / 1 April 2018) is Palm Sunday. On this day the Padrinos (godparents) will give to their godchildren decorated or inter-weaved palm leaves. On Easter Sunday everybody gives as a gift the "Mona", a dough ring with chocolate figures, meanwhile there are also less traditional characters with a lot of appeal to them, such as Harry Potter. In Spain, including Barcelona, the cult of the Virgin Mary is very strong. That is revealed; by the means that many churches of the Virgin Mary and religious festivals in processions to their honour will be held. And if it is not the Virgin Mary, then another young woman as a city patron or patron saint will be revered. This is also the case in Barcelona. The procession of the Virgen de la Macarena starts from the Eglésia de Sant Agusti in the Raval quarter to the Old Town. The beginning is on Good Friday by 5pm. The solemn procession then moves on with some detours to the cathedral in the Barri Gòtic, where it arrives about 8pm. A huge statue of Mary will be carried by the Costaleros, members of religious brotherhoods, the Cofradías. The Costaleros are dressed in their festive day robes. Especially the so-called Nazareros are attracting attention. These are the members that wear penitent vesture with sharp, coned hoods. These robes and headdress of theCofradías is a centuries-old tradition. Barefooted, they are dressed in black penitents bearing a heavy chain behind them as they accompany the procession. Sometimes you can hear a plea of grumbling from the ranks of the audience when the procession is passing. The moans will be accompanied by a drum roll. Easter in Barcelona is not quite as distinctively celebrated as in the south of Spain. One gives away a little gift like chocolate eggs and chocolate bunnies, as in Central Europe. The traditional Easter rites, such as e.g. the fast breaking have in everyday little importance. 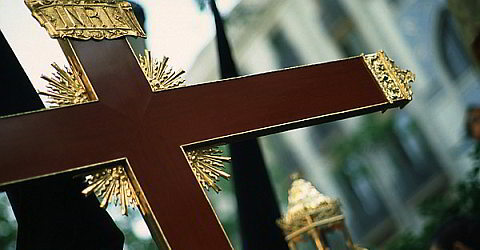 Although the Christian roots of this festival are still clear and precisely the Semana Santa is very important and extensively celebrated. The history of the Catholic brotherhoods goes back to the 16th Century. In that time, the Holy Week, from Palm Sunday to Easter Monday has their origin. With it the population should learn more about the Passion of Christ. The different brotherhoods usually organise one procession each year. This leads from the parish church of the Brotherhood to the cathedral and back. Among each other, there is a lively competition, who organised the best procession. The liturgical practise was regulated for the first time in the Council of Trent. We have summarised general advice on climate and weather in Barcelona on a special weather and climate site. The weather during the Easter period is characterized by longer and warmer days. But it can still be chilly and from time to time rainy. Especially if Easter is very early like in 2008. You should take slightly warmer clothing and a light rain protection with you. The hotel prices are not significantly more expensive than at other seasons, regarding your flight prices you have to accept some increases, since Easter time is the peak travel time in spring. However, you can save quite a few Euros if you are flexible during Easter week and if you don't fly at the bank holidays. Our flight booking system allows you to compare flights from over 80 different airlines. Not everyone flies from every airport to Barcelona. The prices of airlines on Barcelona.de are already stated including taxes and booking fee. Therefore you have a very high level of transparency. In Barcelona, there is an English Protestant and Catholic community, each of them will also hold services in the English language. The International Church of Barcelona is an multi-denominational multi-cultural church and open for all confessions. The exact dates of worships can be found on their websites. Most of the restaurants in Barcelona are open during the Easter holidays. On our restaurant site you will find the restaurants grouped by their quarters with addresses and telephone numbers. Usually they also speak English. Shops are closed on Good Friday, Easter Sunday and Easter Monday. Maundy/Holy Thursday is not a holiday. Museums and other attractions will be open over the holidays. Since Monday is a bank holiday the usual rest day of Museums is omitted and they are open. For the exact opening times please refer to the attractions site. Subway and buses operate during the holidays like at normal weekends and bank holidays, though with fewer buses and subways.